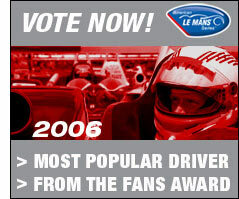 Voting for two of the most coveted awards in the American Le Mans Series – Most Popular Driver and From the Fans – remain open through midnight Oct. 1, to coincide with the conclusion of the Petit Le Mans powered by Mazda CX-7 weekend from Sept. 27-30. You can access fan polls here. In addition, Series television partner MotorsTV is giving away a trip for two to the Monterey Sports Car Championships as part of the group’s “Most Popular Driver” award. Nominations can be made here.